Minister of Culture and Traditional Affairs Professor Nkandu Luo said the Patriotic Front (PF) Government does not want to regret at the end of its first term in office. According to Lambwe Kachali, First Secretary at Zambian mission in Brussels, Luo was addressing Zambian Diplomats in that country. Luo told his listeners that the PF Government was determined to deliver development across the country now and beyond. She said people criticizing the Government that it had failed to deliver after one year in office were not honest and sincere because no Government could do so in such a short period of time especially that Zambia was a vast country. No one present cared to remind Luo that it was her and his friends in PF who promised to develop Zambia in 90 days. Luo said the first year of PF in Government was challenging as they were mapping up the foundation as well as clearing the messy left by the opposition MMD. “You will only understand and appreciate Government’s operations when you are in the system. The messy we found when we took over government was amazing, and the President said this messy has to be cleaned up for good. And he (President Michael Sata) has done that,” said Luo, who, like Sata has been in government before. “There is more sanity in Government now than before,” Luo claimed. She also said it was difficult for PF Government to make significant headway in the first place because the Budget which they inherited from the MMD was not in line with the PF manifesto and vision. Luo said now that the Government had produced its own National Budget, most of the campaign promises would be implemented. 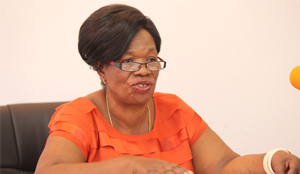 The minister said there would be no excuse for failure because President Sata had made it clear that all ministers should have an input in the budget formulation and ensure resources were evenly allocated. Luo called on Brussels Mission to help look for foreign investors who could invest in projects to develop rural areas. “The PF manifesto is precise on rural development. We want our rural areas to develop so we could minimize rural-urban migration,” said Luo.